The National Coordinator for Opuntioid Cacti, Shauna Potter visited Mt Buckrabanyule on Friday 16th November. Ms Potter is undertaking a tour of areas in Victoria to gather information on Wheel Cactus and other Opuntioid Cacti, and the works being undertaken to control these invasive weeds. Along with representatives of the local Wychitella District Landcare Group, Parks Victoria, the North Central Catchment Management Authority and the Loddon Plains Landcare Network, the gathering enabled a broad ranging discussion on the Wheel Cactus infestation at Mt Buckrabanyule from a National through to local perspective. The group visited some of the core infestations on the mountain and heard from locals as to some of the issues arising from the weed and it’s control. 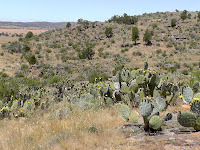 The LPLN is developing a project proposal to help control the Wheel Cactus on the mountain, which is a main infestation and source in the district. The most effective treatment for Wheel Cactus control is stem and pad injection with glyphosate. 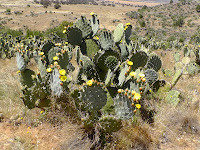 Photos by Anthony Gallacher: Core infestation of Wheel Cactus (right), locals and representatives (middle), a large Wheel Cactus specimen (left).